Wed, Mar 20, 2019, 11:54 pm SL Time, ColomboPage News Desk, Sri Lanka. Mar 20, Colombo: Prime Minister Ranil Wickremesinghe says Sri Lanka currently is in a transitional period and the country will be able to meet its economic targets in the next five years. 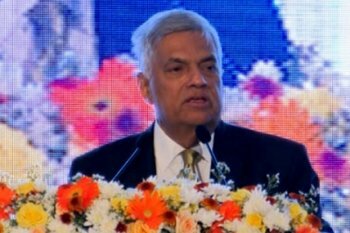 Addressing a business forum in Colombo last night, the Prime Minister Ranil Wickremesinghe said the government had been able to complete all the loan installments due in 2018. The business forum named "Fire Side Chat-2019" was organized by the International Chamber of Commerce and the DailyFT newspaper. Sri Lanka's top business leaders, key political leaders including the Prime Minister joined forum. The main objective of the panel discussion was to focus on the new trends in the economy. Expressing his views in length, the Prime Minister said the challenged before the country is to increase the export income. "During the past few years, while we have witnessed a significant development in a number of non-trade sectors in the country, the situation in the trade sector remains the same and needs to change. We need to move forward in development with the favorable financial conditions. However we are in a transition period," the Premier said. He said in the coming months, it is expected to reduce interest rates, control inflation and to create financial discipline. The Premier added that in order to develop, it is necessary to introduce new sectors and the government is fully committed to provide facilities for the investors. Responding to questions raised by the investors at the forum, the Prime Minister said the pride of place should be given to investments for strengthening domestic economy and the government has already embarked on a series of programs in this connection. The Premier added that the government is ready to provide tax relief for investors and contemplating long term and short term programs.